The following interview was recorded by our colleagues at Shabka in 2013. There are, however, two reasons for its re-publishing today: the recent and very sudden death of Chantal Mouffe’s husband, Ernesto Laclau, with whom she wrote the extremely influential book Hegemony and Socialist Strategy. And secondly, the continuing march of xenophobic and euro-sceptic politics against diversity and transnationalism. “Right-wing populist parties offer simple and clear-cut answers to people’s fears by constructing scapegoats and enemies that they blame for society’s problems,” writes Ruth Wodak. Chantal Mouffe’s answers are less simple, but revealing. They remind us not to stop asking why. The 2013 elections in Austria showed a significant rise of right-wing populist parties. This development seems to be a European phenomenon. Some experts connect it with the declining welfare-state. Would you agree with that? Chantal Mouffe: I’ve been working on populist parties even before they were spreading all over Europe. In fact, my main research has been done in Austria about the development of the (Freedom Party) FPÖ and Jörg Haider. I was very unsatisfied with the view that was developed by Anthony Giddens in Britain, but also by Ulrich Beck in Germany, about the Third Way or the Radical Center. They argued that it was important to have consensus at the centre between left and right. From that centre-left and centre-right emerged because there seemed to be no alternative. They presented it as a progress for democracy; that it was becoming more mature. In fact, I argued that this is not a progress for democracy. There was no possibility through the traditional representative democracy to offer alternatives to the existing order. I wanted to show that the consequence was the development of right-wing populism. Another aspect of my critique was passion. What do you mean by passion? Chantal Mouffe: I was trying to show that the success of right-wing populism was precisely because they were recognising this dimension of passion. I want to acknowledge that by passion I understand something very specific. There is much discussion about emotion. Some people talk about an ’emotive turn’ in politics. But passion is different from emotion: emotion fits into an individual perspective while passion has something to do with the formation of collective identity. It has something to do with an affective dimension in the creation of collective identities – in the formation of the „we“. Nationalism is a good example for that, where passion is created around a „we“. It is absolutely impossible to understand the development of nationalism if you leave aside the aspect of passion. Why did you focus on Jörg Haider and the Austrian FPÖ? 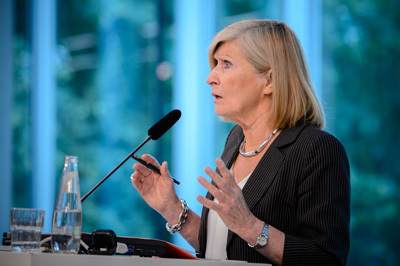 Chantal Mouffe: I took the example of Jörg Haider because it was an excellent example. In fact, I showed that the development of right-wing populism took place much earlier in Austria. When I began to study, the other important right-wing populist party was the Vlaams Block in Belgium, which is now called the Vlaams Belang. Those were the main two parties. What I showed was that the FPÖ succeeded because of the grand coalition in Austria, as it has been since the Second World War. There were two “Lager” (political camps). Since then, everything had to pass either through the (christian-conservative) ÖVP, or the (social democratic) SPÖ. To get a post at the national broadcasting station (ORF), you had to be a member of one of these parties. This created a lot of frustration. My argument was that the FPÖ was an expression of democratic demands. People wanted to have more democracy but these demands were expressed by, and articulated through, right-wing rhetoric. People said that the FPÖ were Neo-Nazis. But it was completely absurd to present the FPÖ under Haider as Neo-Nazis. I was interested to show that quite an important sector of the people voting for the FPÖ were coming from the SPÖ. The main answer until today is that in comparison to traditional parties, these parties used moral condemnation. Why didn’t left wing parties use the same strategy? Chantal Mouffe: Traditional left-wing parties never tried to understand that, because it would force them to auto-critique. That was the kind of argument I was making in my book On the Political. Since then, it is quite ironical because at the moment when the FPÖ and the BZÖ – (a splinter of the FPÖ) – divided, I thought that there would be a decline of right-wing populism. But this is certainly not what has been happening – all over Europe. The emergence of right-wing populist parties in many countries – in Scandinavia for example – can be explained with the incapacity of socialist parties, which define themselves as centre-left, to adjust to demands. Also because these parties directed themselves to the middle classes. The traditional working classes create a problem for them because they don’t see a space for those people in the process of neoliberal modernisation. They really define their programme around modernisation, which means to adapt oneself to neoliberal modernisation. This threatens this sector of the population for which the socialist parties have no discourse anymore. They don’t fit into their view. So these sectors are a very good terrain for right-wing populist parties to show that they provide as an alternative. Why does the current situation favour right-wing populist parties? Chantal Mouffe: The left was so much dominated by the rationalist view that passion seemed to be something bad. First, they were convinced that there was no alternative to neoliberalism. This is very much linked to the hegemony of neoliberalism. So they could not really visualise a political alternative to that. But on a different level, they also believed that they needed to have a rationalist discourse. The mobilising passion was something that only the right could do. But I think it is wrong to believe that only the right can use passion. My proposal in this regard is the development of left-wing populism. What do you understand by left-wing populism? Chantal Mouffe: As I said, this is changing. We see Mélenchon in France, or DIE LINKE in Germany. DIE LINKE has been accused of being populist. Here we need to look at another aspect: one argument I have been making in The democratic paradox is that our model of democracy, the Western model of democracy, is an articulation between two different traditions. The liberal tradition (insisting on the value of liberty), and the democratic tradition (insisting on the value of equality). But this is like putting together the “Reichsstaat”, the defense of individual rights, and the idea of popular sovereignty. There is a tension between liberty and equality, a tension that can be reconsiled. But you cannot have a society with perfect liberty and perfect equality. It is impossible because one element would always be more important. Now with neoliberalism it is clearly the liberal tradition that has become absolutely dominant. This is why we propose democracy: the idea of popular sovereignty, the importance of the people to decide is what we propose. So breaking with neoliberalism – should this be the “aim” of left-wing populism? Chantal Mouffe: For me, this is what left-wing populism should be about. Of course it will take many different forms. If I speak of left-wing populism, it’s not just one model. What is at stake here is the creation of a collective will from the articulations of different population sectors. A kind of popular project for different social factions, where different sectors of the population can identify themselves and create what I call ‘a chain of equivalents of democratic demands and transformation,’ of radicalization, of democratic institutions. That’s why I insist very much on the fact that this should not be seen as a rejection of democracy. But there is indeed a need to democratise democracy. Countries are not representative enough, there are many sectors that are not represented. Like young people, who are unemployed and do not see that the parties are working for them. If we think about the future of the European left, how should social and political movements translate their demands into political contexts? Chantal Mouffe: There is no general answer to that. But I think it certainly requires transformation on both sides, the side of the political parties, and on the side of the movements. Because one of the problems with many of these movements is that they are absolutely anti-institutional: they don’t want to work with a party, they don’t want to work with a trade union. One can understand why they act like that because they have often been under their dominance. Parties should recognise that. Do movements need to develop a critical programme for alliances with leftist parties? Chantal Mouffe: I don’t think that a social movement should do that alone. They should do it together with the party. I think the principal role should be that of the party. A left-wing populist party needs a programme that is elaborated by the party. The Occupy movement, in fact, was criticised by some people for not having demands. I think it is important to have demands, but Occupy cannot say what “needs” to be done. That is absurd. Establishing a strategy is not the role of a social movement. The role of the social movement is to make demands, to bring to the fore what is problematic. But it is not the role of the social movement to provide measures, they should not say: “This is our demand and that is what we should do.” The social movement proposes things, questions, and demands. The party should establish strategies on the basis of that; bring questions and demands to the parliament, propose laws and so on – that’s why I think the role of the party is really necessary.